This is the fourth part in the series "for organists: changing the culture at your church." I've already outlined several complaints organists typically have with their churches, talked about what a lonely position an organist can find themselves in, and complained about some of the things that happened to me when I first came to my current church. Now it is time to discuss ways to deal with some of those issues. The first of these issues was generally being ignored/forgotten about in the crush of church business, and the answer to that will be in forming relationships with the rest of the staff. This also gives me a chance to brag about the staff at Faith UMC, who I will really miss in a few months. 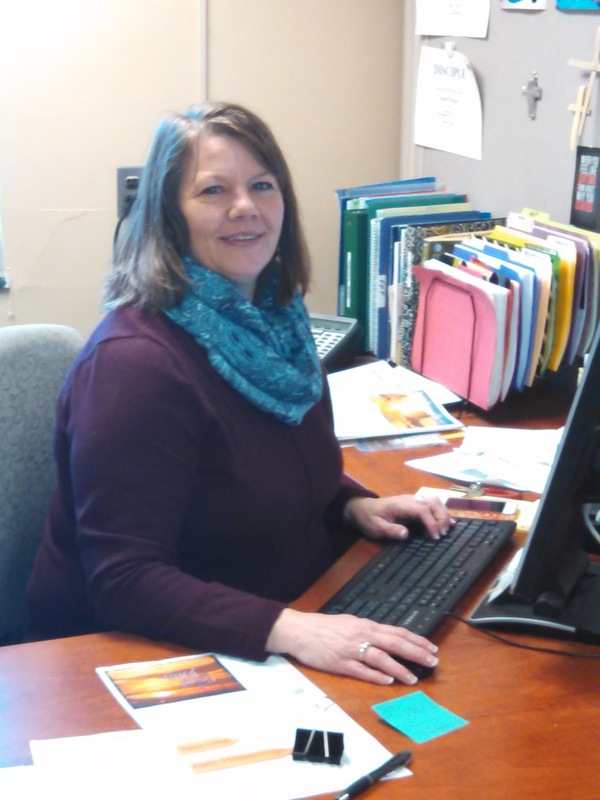 This is Janelle Keltgen, our Office Manager. She's been on the staff since 2008, so when I complained in the last post about being left out of the bulletin years ago that wasn't her fault! In fact, it's pretty unlikely that would happen today. If Janelle has to print the bulletin early, she sends an email to everybody who needs to know that, besides warning us at the staff meeting. And when it comes to issues around weddings and funerals, or double booking the organist, I know she's got my back. If I wasn't able to attend a meeting and a decision that might require me to be in two places at once were being made now, I'm sure she'd be one to say "but what about Michael?" Over the years, she has even indulged some strange requests from her organist. Once she even helped me with the pre-recorded half of an organ duet I was playing on Sunday, by playing a note I couldn't get to because of the wide reach. Few congregants are aware that one of the notes of the opening voluntary that week was played by our office manager. She had a sense of humor about it. On practice breaks I frequently visit the office to steal candy from the jar, or to catch up on the latest at Faith--you never know when one of the stories that makes life strange and interesting may break out--and sometimes she even visits me in my office, the sanctuary. But our best time together is Thursday mornings. Thursday is bulletin day. Some years ago I started coming in to help her with the bulletin. I was a little worried about it at first, thinking she might interpret that as my thinking she couldn't do a good job on her own and needed somebody to look over her shoulder to get it right. But that's not the case. Church bulletin are pretty complicated creatures. True, it doesn't hurt to have somebody else proofread any document so some crazy error doesn't sneak in. Proofreading your own work can be tricky unless you leave enough time to come back to it after a period of being away from your work--which is exactly what you can't do here because she has to put it together the same morning she gets all the information from all of us. And that's the next problem. When errors do creep in, it might not be the fault of the person putting it together. Suppose the choir director wrote in the wrong number for the hymn (we usually look those up now to double check) or wrote something illegible. Suppose the organist spelled the opening voluntary wrong (what a dummy!). Suppose some minor change in the procedure for that week's service occurred that even someone who regularly attended that service wouldn't notice, but maybe the worship leaders would. Or one of the pastors changed the scripture reading and put it in the email but not in the other email. In other words, we are all prone to make mistakes. An extra pair of eyes and ears is just a better defense. Maybe I'll catch something. And that's just a normal week. Some weeks the bulletin gets really complicated. There have been times when, just to make sure I've heard correctly from the choir director, or the creative worship team who meeting I was at last week, or the pastor, we end up having a conference call to make sure something is right. Like the week I noticed we were going to light the advent candles before the presentation (bringing in) of the wreath (which went around the candles), which I am pretty sure would have been dangerous! There are several of us who coordinate our efforts to make worship happen each week at Faith, and making sure we are all on the same page is an all-out effort for each of us. Janelle and I kid around about how pleased I am to find a mistake in the bulletin so I can use the red pen (which she usually doesn't let me have anymore) or how depressed I get when I can't find a nit-picky mistake like a rogue period . Like that one. Did you notice the extra space? I must make far more of those errors than she does, and you better believe if there are any typos in this blog I'll hear about it! Janelle is also a friend, and a fan of the band I'm in with a few church members and other friends. I think she led the cheering section down front when we played at the Krannert Center last week. We'll all really miss her when she leaves. Ok, now I'm bummed out. Hey, Janelle, want to cheer me up with some more of those goat videos?